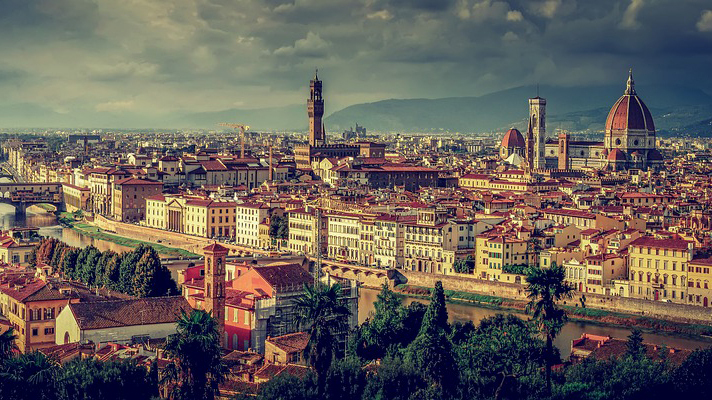 Search for the best flight prices from Manchester to Florence. Compare prices, book today and save money with Manchester Airport. If you’re searching for stunning city-views, world-famous art and gourmet food, then look no further than Florence. Recognised internationally as one of the focal points of the medieval renaissance period, the city is simply bursting with cultural attractions; from the spectacular Cattedrale di Santa Maria del Fiore in the city centre, to Michelangelo’s iconic statue of David, located in the Galleria dell'Accademia. Due to its abundance of artistic and architectural heritage, Florence has previously been ranked as one of the most beautiful cities in the world – it’s certainly the perfect place for a relaxing city-break or romantic weekend getaway. Like most cosmopolitan European cities, Florence has a wide range of places to stay. Couples looking for more sophisticated accommodation might want to consider the likes of the swanky J.K Place Firenze, located within walking distance from both the Cathedral and Santa Maria Novella train station. The town-house style hotel is classy and reputable, with all the necessary facilities and comforts. More modest lodgings can also be easily found around the city centre, with guesthouses such as the Hotel Milu providing interesting and stylish interiors and superb access to the sights of the city. In addition, the multiple budget hostels dotted around town offer cheap rooms that can be reserved on the day, for back-packers who are simply ticking Florence off the European, must-see city list. As well as its cultural significance, Florence is also a known hot-spot for European fashion. A handful of major fashion brands such as Gucci, Roberto Cavalli, and Emilio Pucci are headquartered in Florence, and the Via de' Tornabuoni houses many more luxury upmarket labels, such as Armani and Bulgari. Another main product of the city is leather. If you’re looking for something authentic, but perhaps slightly less extravagant than a designer sweater, then wallets, belts, coin purses and gloves are great souvenir alternatives, with more reasonable price tags. The Ponte Vecchio is also home to an abundance of shops and stands selling all sorts of unique jewelleries and trinkets. A plethora of cafes and restaurants line Florence’s cobbled streets, serving up all the classic Italian cuisine you could hope for; coffee and pastries in the morning, light salads (perhaps with a cheeky glass of wine) at lunch, and sumptuous pasta dishes for dinner. Those looking for a proper Italian pizza experience may want to try Gustarium which is located near the centre of the city, near to Signoria Place, serving fresh and unique pizza slices al taglio. The other quintessential Italian foodstuff is gelato which, legend has it, was invented in Florence by Bernardo Buontalenti during the renaissance. Your sweet teeth will be well-catered for, as gelaterias seem to appear on almost every street corner, especially during the summer months. Wine lovers will be more than satisfied too, with the renowned Chianti wine region just a short drive from the city. Why not book yourself a private car tour? There are various religious festivals and celebrations that take place throughout the year in Florence, each one as visually impressive and reverent as the last. The annual celebration of the Florentine new year, which marks the Annunciation of the Blessed Virgin Mary, takes place in March. Townsfolk traipse through the city, from the Palazzo Vecchio, dressed in traditional medieval dress and playing music. The celebration continues throughout the day with an outdoor market, open to both citizens and visitors, that provides authentic Italian cuisine before an evening concert, and the chance to visit the frescoes of the Annunciation within the Santissima Annunziata. Another significant event is the Festival of the Paper Lanterns, which takes place in September -the eve of the feast of the Nativity of the Virgin Mary. Again a parade of Florentine citizens, starting at the Piazza Santa Croce, walk through town carrying paper lanterns illuminated by candles within. The tradition dates back to the Renaissance, when pilgrims would process to the Church of the Most Holy Annunciation to worship. The events of the festival also include a speech by the Cardinal of Florence’s Cardinal in the Piazza Santissima Annunziata.